There are very few people among us who doesn’t want his or her diet to get healthier. So I’m issuing a challenge for March: the Healthy Eating Challenge! This challenge is meant to be doable and promote small, gradual change … but also help push us a little out of our comfort zone so that we can have a powerful change within a month. It’s not going to change your entire diet all at once, but it can help you move to a healthier diet. Each week, pick one mini-challenge from the list of mini-challenges. See the list below. You pick one mini-challenge for the week that would be an easy, positive change for you. Don’t choose anything you won’t be able to stick to. Pick one to start today! Commit to doing that mini-challenge for the next week. I suggest you join us in my Sea Change Program, as we’re doing this challenge together and will hold each other accountable. We also have small teams you can join if you want greater accountability and support. If you want to do it on your own, commit to a group of friends, family or colleagues on social media or via email. Report back after a week, and choose a new challenge. Each Monday, report how you did to your group (we have a challenge channel for that in my Sea Change Program). Report your successes, where you fell short, what you learned and what you’d like to do differently going forward. Then commit to a new mini-challenge (or stick to the same one for another week). It’s that simple. Choose from the mini-challenges and commit to it for the week, picking a new one each week. One small change at a time. Gradual change is the most powerful change, and this challenge is the perfect way to do that. Weekly articles to help you make the changes. A live video webinar where you can ask me questions. A Slack community where you can get support, join a small team, ask questions. A huge library of video courses on changing every habit in your life. Add whole grains to your meals. Eat a hearty salad for lunch every day. Decide on healthy items to order before you go out to eat with friends. Bring healthy food to a pot-luck party or work gathering. Cook your healthy food in big batches and eat during the week. Eat slowly and stop before you’re full. Set portion sizes and try sticking to them. Don’t eat if you’re not actually hungry. Try for high-volume, lower-calorie foods: vegetables, beans, fruits rather than white starches, meats, and fried foods. Eat fruit instead of one of the sweets you normally eat. Drink tea instead of soda. Cut back on the number of alcoholic drinks you have each day by one. Eat less pastries, bread and other white flour. Bring a healthy lunch to work instead of eating fast food. Try Ezekiel flourless cereal instead of sweet cereal. Switch from processed meats (sausages, bacon, etc.) to real meat, or fish. Try eating one meal a day with no meat. Reduce dairy or egg intake (use soymilk or almond milk on your cereal, for example). Try cooking with tofu, tempeh, or seitan. Try some awesome lentil recipes. 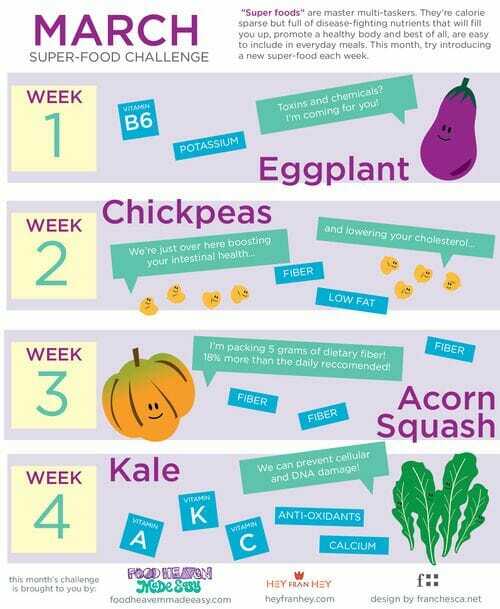 If it sounds easy and you’re already used to vegan food, try the 7-Day Vegan Challenge. Not every change listed above for everyone. Find changes that feel right to you, as I know not everyone agrees with everything I’ve listed. What is healthy for you will be different than what is healthy for me. I believe in a vegan diet (out of compassion for animals) and try to eat whole foods as much as I can (but not religiously). That doesn’t mean you have to do that. The one thing I believe is in trying to get foods that are full of nutrients — vegetables, fruits, beans (and legumes), nuts, seeds, whole grains — and eat less of the foods that are mostly empty of nutrients (processed foods, white bread and sugar, fried foods). Again, you don’t have to be religious about it — I eat cookies and French fries just like most normals! Are you ready to start the challenge? Start today by joining my Sea Change Program.